Deciding to invest in an effective car battery tester is always a wise move as you never know when your battery will fail. A good car battery load tester displays result in less than 2 seconds and will help you to check the health status of your battery. You will be able to tell if you are dealing with a low or a defective battery in seconds. However, there are many battery testers in the market and picking the best one may be a daunting process. This car battery tester review will help you out. Have a look at the comparison chart below for the top 3 picks of battery load testers recommended in 2019. It discharges smoke when you first connect. May fail to accurately display test results at times. Bottom Line TT TOPDON Auto Battery Tester is appropriate for DIY It is built for average persons who are looking to test their batteries. SOLAR BA327 load tester is user-friendly and average car owners and DIY can comfortably use it. TOPDON AB101 is a small battery tester that is compatible with 8-16DC battery test. Also, you can test AGM flat plate, regular flooded, gel and deep cycle, AGM spiral batteries. This TOPDON battery checker uses conductance measurement technology that is designed for 8V to 16V cars as well as light trucks. It can accurately test battery health status, cranking power, and voltage. 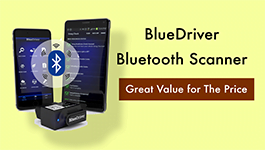 You will be able to perform charging and cranking test on lead acid, spiral plate, gel, and AGM flat plate batteries of 8V to 16 V light truck and passenger cars using this battery tester. It is also fitted with polarity reverse-connection protection meant to protect your battery while testing. 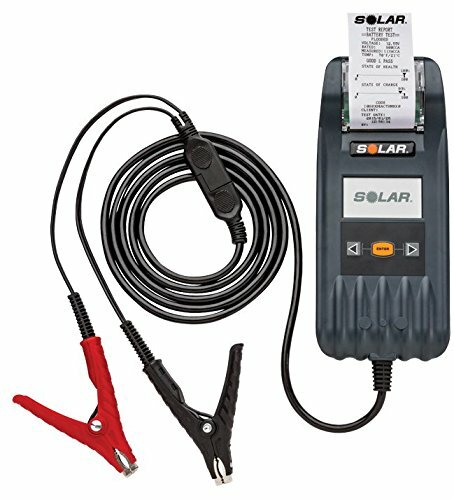 This auto battery tester allows you to directly test batteries with low charge or when they are removed from a vehicle. TT TOPDON AB101 can accurately test battery health status, cranking power, and voltage. Durable and has an ergonomic design. 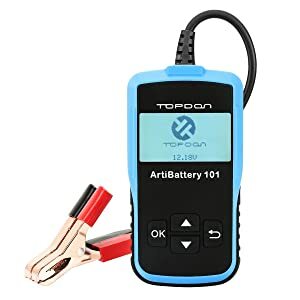 This TOPDON car battery tester is appropriate for DIY and any individual who want to establish the health status of a battery. If you have an appliance that uses 8 to 16 volts battery then you can use Schumacher BT100 to evaluate the health status of the battery. When you need to test how badly damaged your battery is, then you can use BT-100, one of the best Schumacher Battery Testers. This auto battery tester can test battery condition, test loads, starter motor draw, and avail a complete diagnosis of the charging system. Schumacher BT100 is capable of supporting 100 Amps load test on your 12-volt batteries and 50 Amps load test for 6-volt batteries. You will notice that it has a shock resistant meter that is well housed in a rugged and sturdy steel case. The Schumacher BT100 car battery tester also has super-grip battery clamps as well as top mounter switch that significantly increase ease of use. The downside is that it’s a bit heavy than most of the comparable units. If you have an appliance that uses 8 to 16 Volt batteries then you can use Schumacher BT100 to evaluate the health status of the battery. This auto battery tester also supports a number of battery standards that include SAE, EN, IEC, JIS, MCA, CA, BCI, and CCA. It also supports a number of battery standards that include SAE, EN, IEC, JIS, MCA, CA, BCI, and CCA. Schumacher BT100 is built for average car owners who are looking to test their bad car batteries. Solar BA327 car battery load tester is user-friendly and built for average car owners and DIY people. Solar BA327 is an effective car battery load tester that can effectively test 6v to 12v batteries. It is designed to test multiple batteries and accurately display their starting ratings. The test varies from 40 to 2000CCA with operating range of 1.5 to 30V. Solar BA327 is one of the best battery testers that has a built-in printer that uses a standard thermal paper to record the test results. 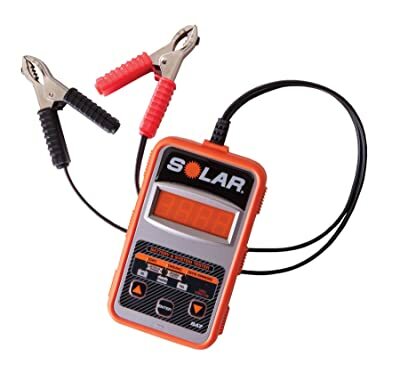 This Solar battery tester also has 10-foot cable leads, a comprehensive track of performed tests, and a warranty tracking code designed for every test performed. The downside of this auto battery tester is that the cable is not detachable. You will be spoilt for choice when it comes to different types of battery you can perform using this car battery tester. The tester is compatible with 6V and 12V batteries. It can also test AGM flat plate, regular flooded, gel and deep cycle, AGM spiral batteries. Solar BA327 is a great pick for 6V and 12V batteries. This car battery load tester is user-friendly and definitely built for average car owners and DIY people. Foxwell BT100 supports multiple rating systems that include SAE, EN, IEC, JIS, MCA, CA, BCI, and CCA. 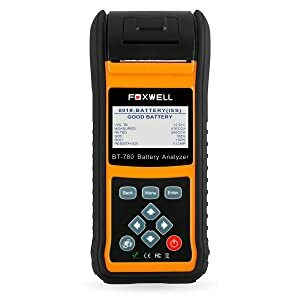 Foxwell BT100 battery analyzer is dedicated to test and provide accurate results on gel, AGM spiral, AGM flat plate, and regular 12V batteries. 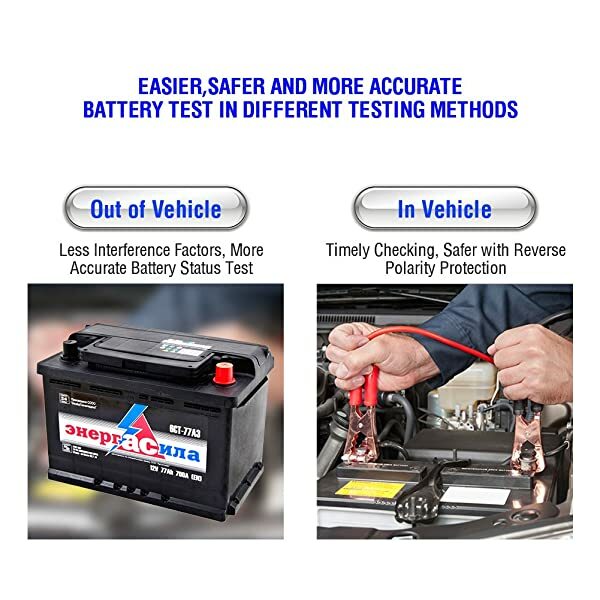 This automotive battery tester provides an easy, quick, and affordable test solution for professionals who are looking to check faults and health status of batteries. The small battery tester is incredibly fast as it can display results within 3 seconds. Besides, it stands out as the best battery tester as it supports multiple vehicle applications that include light-duty trucks and passenger cars. You will notice that this auto battery tester has the rating from 100 to 1100 CCA making it one of the best battery testers. One notable disadvantage of this unit is that new tests will override the previous test results. Foxwell BT100 is used to test 12V batteries. This auto battery tester also supports multiple rating systems that include SAE, EN, IEC, JIS, MCA, CA, BCI, and CCA. Foxwell BT100 car battery tester is built for technicians and DIY guys who work frequently on different batteries. Foxwell BT705 can accurately test AGM flat plate, regular flooded, gel, and AGM spiral. It supports different rating systems that include GB, SAE, EN, IEC, DIN, JIS, MCA, CA, BCI, and CCA. 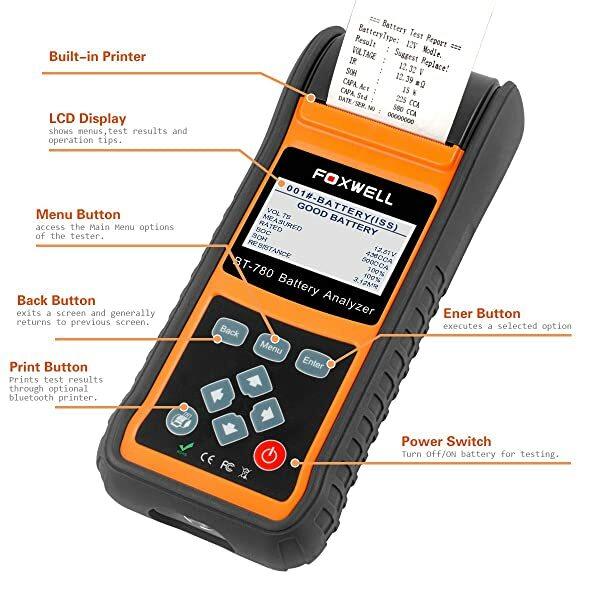 If you are searching for the best battery tester then check out on FOXWELL BT705. This auto battery tester can display decisions on cracking time, cracking voltage, and starter system in milliseconds. You will be able to tell within the shortest time possible if the starting motor is working correctly. 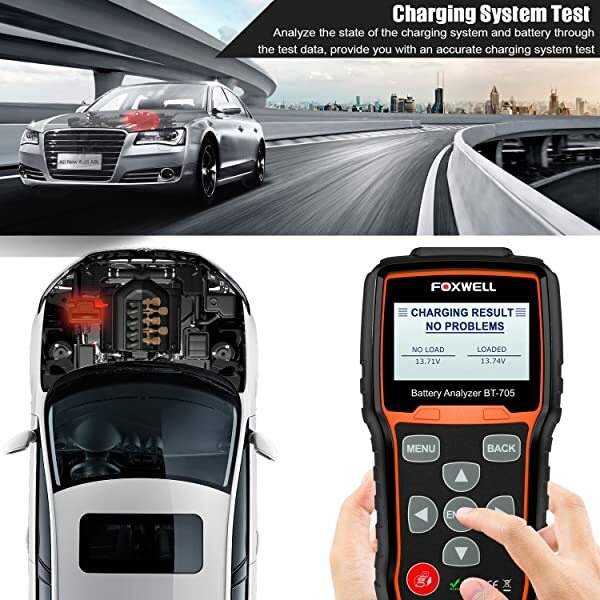 The Foxwell BT705 also allows you to check both the 12v and 24v charging system. 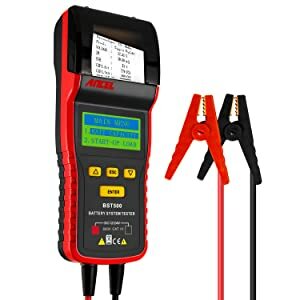 This is truly one of the best battery testers as it will tell you if the output voltage is within the normal range, and charging current is normal. Besides, the auto battery tester will tell you if the rectifier diode is controlling currents as it should. It also allows you to analyze your car battery health status. You can accurately calculate the cold cranking capability as well as the aging status of the battery. Foxwell BT705 can display decisions on cracking time, cracking voltage, and starter system in milliseconds. This Foxwell automotive battery tester can accurately test AGM flat plate, regular flooded, gel, and AGM spiral. It supports different rating systems that include GB, SAE, EN, IEC, DIN, JIS, MCA, CA, BCI, and CCA. The battery tester may fail to display correct reading. 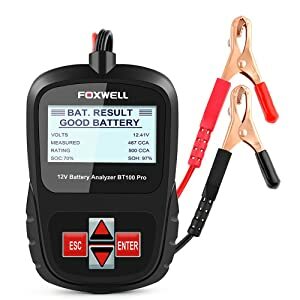 Foxwell BT705 is the best battery tester built for average car owners looking to establish the health status of their car batteries. Ancel BST500 is compatible with AGM flat plate, regular flooded, gel and deep cycle, AGM spiral batteries. It also covers all battery rating standards that include GB, SAE, EN, IEC, DIN, JIS, MCA, CA, BCI, and CCA. ANCEL BST500 is a high-quality battery load tester that can accurately test 12V and 24V batteries rating from 100 to 2000 CCA. This tester can display the battery status in 2.5 seconds advising you if the battery is low or fully charged. The Ancel BST500 battery checker also tells you if the battery needs to be replaced or can be charged. This is because it can detect and indicate if the battery has effective cells. You will notice that this small battery tester can accurately display the charging as well as the starting system performance. ANCEL BST500 has super compatibility. It can effectively support 12v and 24v batteries of automotive, motorcycles, and marine. The battery tester is compatible with AGM flat plate, regular flooded, gel and deep cycle, AGM spiral batteries. It also covers all battery rating standards that include GB, SAE, EN, IEC, DIN, JIS, MCA, CA, BCI, and CCA. Ancel BSt500 can effectively support 12v and 24v batteries of automotive, motorcycles, and marine. You do not have to remove the battery in order to test. Ancel BST500 is built for average car owners who want to find out the status of their car battery. 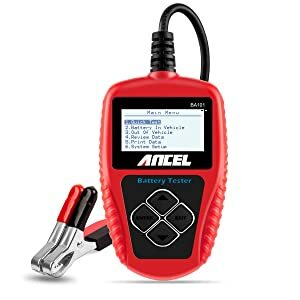 Ancel BA101 car battery tester is built for DIY and technicians who would want to establish the health status of a battery. 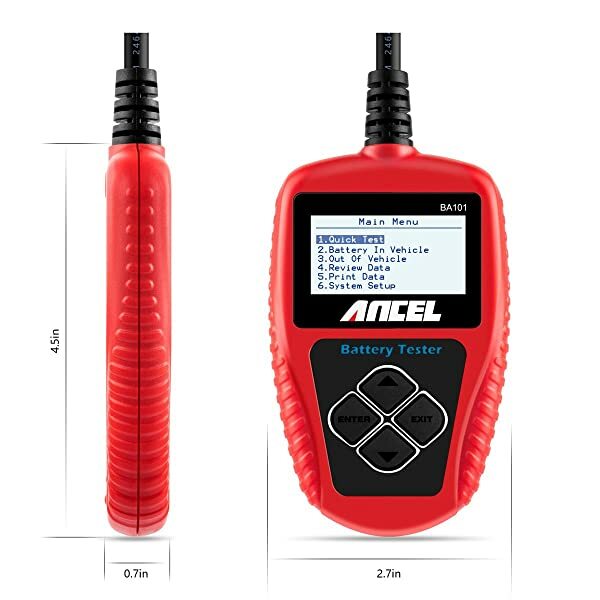 If you are looking for an excellent 12V battery load tester, then check out ANCEL BA101. You will find that it can directly detect faults in the battery without disabling it. The battery checker also allows you to test cranking power, voltage, and age of a battery. The best part of this auto battery tester is that it can precisely and accurately display the test results. Besides, it covers a wide range of battery ratings from 100 to 2000 CCA. You can obtain plenty of results including load voltage, ripple status, unload voltage, as well as the status of the charging system. The downside of the auto battery tester is that it has a short cable. Also, the MCA and CA were programmed wrongly as it shows different result yet it is designated for the same test. Designed for 12V batteries, this car battery tester can test flooded, MF, SMF, AGM, and GEL battery types. It also supports the major battery standards that include GB, SAE, EN, IEC, DIN, JIS, MCA, CA, BCI, and CCA. Ancel BA101 automotive battery tester has a wide test range of 100 to 2000 CCA. Some functions are wrongly coded displaying false results. Foxwell BT780 is appropriate for technicians and DIY people who wants to test the health status of their batteries. FOXWELL BT780 Battery Tester is a great DIY tool. It is applicable for all of the 12V and 24V batteries as well as charging systems. The battery tester is equipped with ripple as well as advanced conductance test, which means that you will be able to quickly check battery health status. Foxwell BT780 will help you detect faults of starting as well as the charging system. Besides, it has a thermal sensor that allows you to print battery test results on the go. Foxwell BT780 is compatible with AGM flat plate, regular flooded, gel and deep cycle, AGM spiral batteries. The battery checker also covers all battery rating standards that include GB, SAE, EN, IEC, DIN, JIS, MCA, CA, BCI, and CCA. 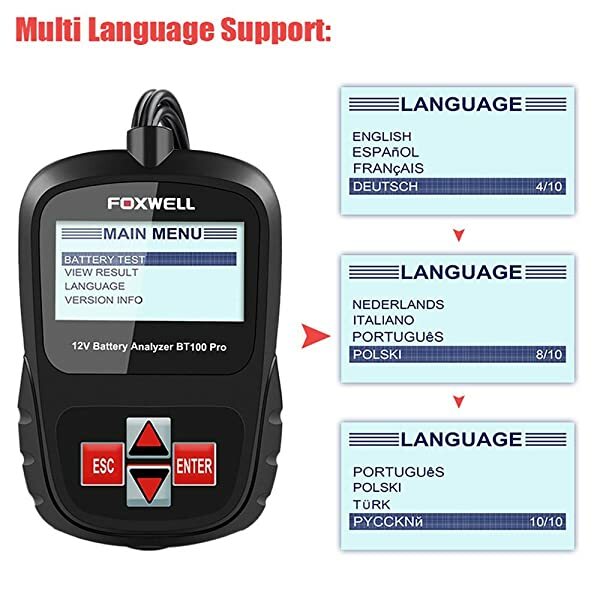 Foxwell BT780 covers all battery rating standards that include GB, SAE, EN, IEC, DIN, JIS, MCA, CA, BCI, and CCA. Can perform analysis without turning off the ignition. 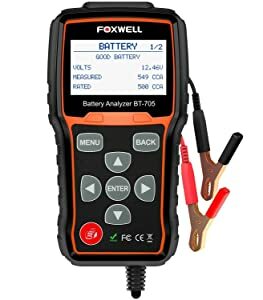 Foxwell BT780 automotive battery tester can is appropriate for technicians and DIY who wants to test the health status of their batteries. Solar BA7 is compatible with SAE, EN, IEC, JIS, MCA, CA, BCI, and CCA. If you are looking to quickly assess the charging and starting system of different types of batteries then you need to have a Solar BA7 battery load tester. The common batteries that you can assess using this load tester include gel, AGM, and lead-acid batteries. It features an operating range of 7-15V and can effectively test batteries that are rated 100-1200CCA. The best part about this battery load tester is that it provides numeric results and fail/pass result for charging and starting system tests. Sola BA7 can work well on a wide range of batteries including gel, AGM, and lead-acid batteries. This automotive battery tester is also compatible with SAE, EN, IEC, JIS, MCA, CA, BCI, and CCA. 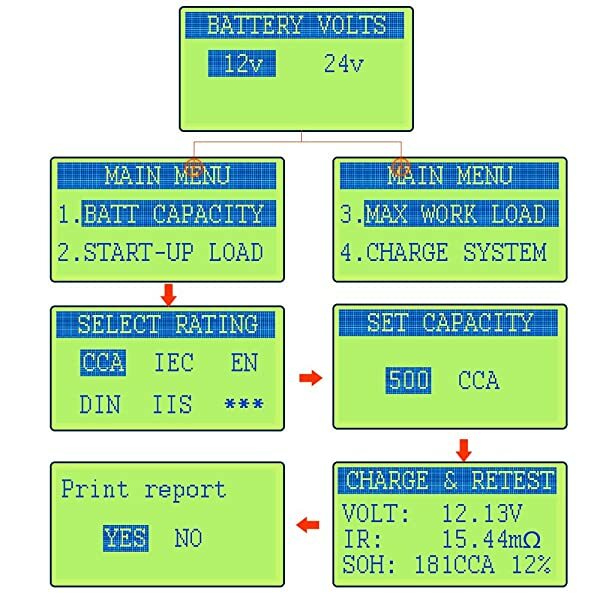 Solar BA7 provides numeric results and fails/pass result for charging and starting system tests. Sola BA7 car battery tester is suitable for DIY and technicians. It is really easy to use and provide accurate test results. 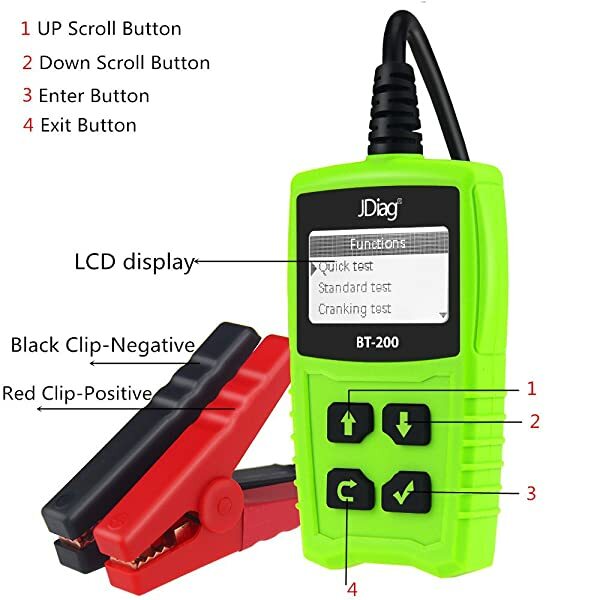 JDiag FasCheck BT-200 is designed to test 12V batteries.This battery checker also supports different battery standards that include SAE, EN, IEC, JIS, MCA, CA, BCI, and CCA. JDiag BT200 battery analyzer will check both the health status of the alternator and that of the battery. It will allow you to effectively diagnose problems as well as perform normal checks. Besides, this battery checker is designed to tolerate high currents and at the same time clearly, display results through a large LED display. It has a test time of approximately 5-10 seconds. You will realize that it comes with a test range of 8 to 16VDC. Equally, the automotive battery tester supports different test modes that include the charging test, cranking test, standard test, and a quick test. JDiag FasCheck BT-200 is designed to test 12V batteries. This battery analyzer also supports different battery standards that include SAE, EN, IEC, JIS, MCA, CA, BCI, and CCA. JDiag BT200 is designed to tolerate high currents and at the same time clearly, display results through a large LED display. 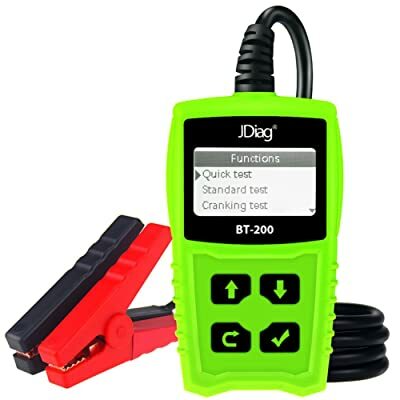 JDiag FasCheck BT-200 is a small battery tester designed for average persons who want to check the battery status of their batteries. Having a high performing car battery tester will allow you to quickly diagnose if you are dealing with a defective battery or a battery with low charge. You will be able to tell if you need to charge your battery or replace it altogether. When buying a battery load tester always look for the best battery tester that is compatible with your battery. Foseal OBD2 WIFI Scanner is not just a scanning device. This Foseal scanner comes with amazing specifications that every motorist cannot afford to miss.